How does digital divide influence art education teaching content and pedagogy? Do you think digital divide influences what we teach in art class? Will the pedagogy be different/better if we have better technological tools? Can we overcome the limitation caused by digital divide? SageStage Minotaur: The discussion about time for all to get together from Taiwan to Uganda is one type of divide. Also, in Uganda they need to use SL lite to participate because of the weak broadband. When teaching integration or potentials of technology in art education, one potential is working with those at a distance. Time coordination and broadband infrastructure are two hurdles. Margie Scrabblebat: The broadband issue and the reluctance of teachers to do anything new is a big problem. Margie Scrabblebat: What percentage of teachers are using - or willing to use these technologies in their classrooms? And if they do use them - how do they use them? Sunny Kolda: SL also is an example of the divide. People are not comfortable with this. Hesitant to start a new thing. Margie Scrabblebat: then there's the issue of hesitance and lack of imagination of how to use this in a creative way. SageStage Minotaur: Yes, different ontological paradigms on what is real. SageStage Minotaur: Some students fear that their lives are being controlled by the technology they use in daily life--their cell phones, ipod, email. The student blogs in response to my prompts are at http://explorations.sva.psu.edu/322/ (click on the blog link). There is excitement, enthusiasm, and healthy skepticism. Margie Scrabblebat: I think there is an enormous divide between the notion of art that is taught in many many art ed classes and what kids are really doing. SageStage Minotaur: The blogs and the activities in my class is my approach so that it is not didactic in telling, but rather students' come to see purpose and how to use and models from being the experiences I facilitate. SageStage Minotaur: lots of kids are doing cutting edge work, leadership initiatives, and are far more experienced in integrating technology in their artmaking on a daily basis than most art teachers. It is the digital divide among youth--those who do not have access, broadband, etc.--and evey they find ways to play with technology. SageStage Minotaur: NET Standards are part of school curricular expectations now. How have they impacted art classes that you are familiar? SageStage Minotaur: On the NAEA research steering committee I have been asked to develop research questions for action research for k-12, community, and pre-service. Kristy Handrick: what was your experience about useing Open Sim to teenager, Liliann? 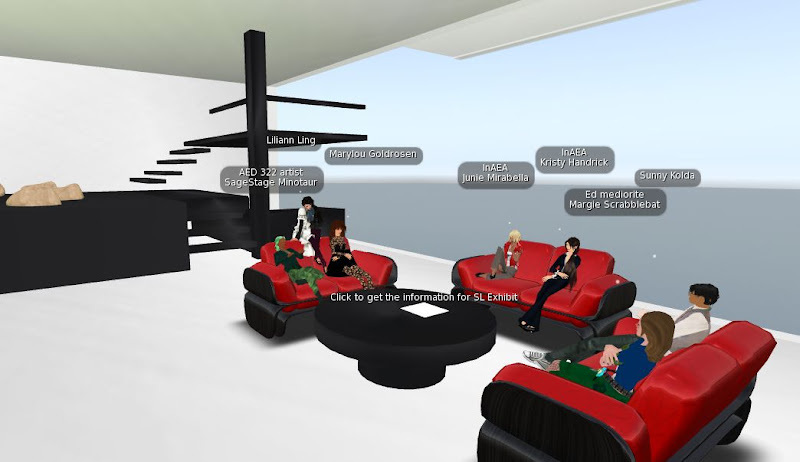 Liliann Ling: OpenSim is good for some project, but not as good as SL in terms of technology. Student's love the fun of virtual world, but the technology didn't keep up with the need. SageStage Minotaur: For k-12, considering the "Blueprint" with literacy and STEM, I think what art has to do with literacy in 21st c is important to develop. Similarly with STEM. SageStage Minotaur: I have not read the MacArthur. Ryan Patton's dissertation on gaming Katie Salen's "Quest to Learn, the nation's first public school based on the principles of game design. Based in New York City, it is testing a new approach to teaching and learning that could become a model for school innovation." http://www.macfound.org/site/c.lkLXJ8MQKrH/b.4462309/apps/s/content.asp?ct=8045175 I have read many of the papers published by MacArthur, which have been very helpful to me. Students in my ug class read the Origin Synners one this semester. Synners refers to synthesizing. It is good to look toward the future. 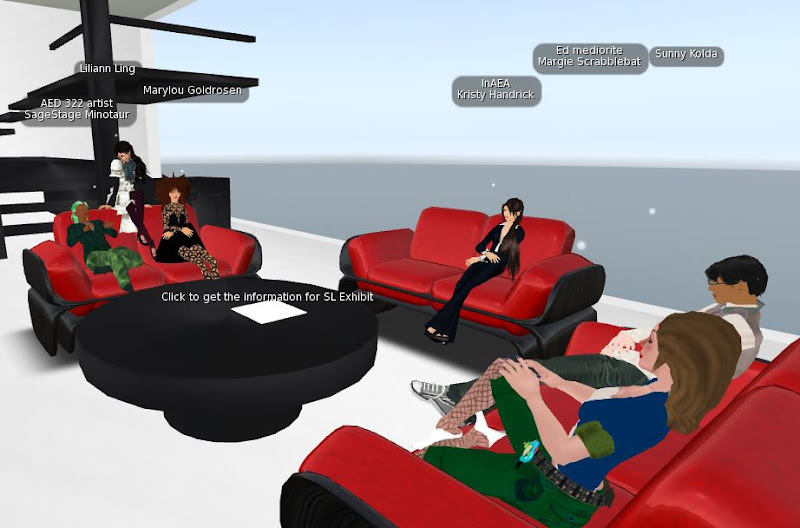 Fieldtrip discussion topic: Virtual worlds: imagination, reconstruction, or expression?